The male fish develops extended filaments on the dorsal fin. A fine thread or wire. 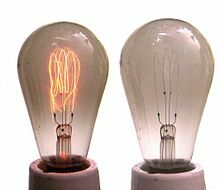 Such a wire, as can be heated until it glows, in an incandescent light bulb or a thermionic valve. (physics, astronomy) A massive, thread-like structure, such as those gaseous ones which extend outward from the surface of the sun, or such as those (much larger) ones which form the boundaries between large voids in the universe. (botany) The stalk of a flower stamen, supporting the anther. (textiles) A continuous object, limited in length only by its spool, and not cut to length.